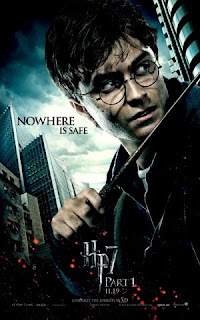 Is anyone else as excited as I am about the newest Harry Potter movie??? I’ve bought our tickets, the other half is resigned to sitting in a theater with hundreds of screaming kids, and I’m even pulling out my Gryffindor scarf for the event. I briefly thought about going to the midnight showing, but who am I kidding? I can barely keep my eyes open after 10pm! So, we’re going tonight and I honestly get all squee-ful just thinking about it! I’m slightly bummed that they’ve broken it into two movies (and that I have to wait until next JULY to see it), but if they’ve done a good job and fleshed out the story well, I’ll forgive them. How about you guys? Anyone else going to see HP this weekend? Are there other movies/books coming out soon that you’re excited about? I forgot how much of book 7 takes place outside of Hogwarts, so that took a bit of getting used to, but the cinematography was awesome! I'm looking forward to it, but like you, wish it were one movie. 🙁 I hate waiting! Already saw it. Loved. Every. Second. So glad to see the fans around the blogosphere rallying to support The End *sobs* Makes me feel like we're keeping Rowling's world alive by doing so. Hope you love the movie!!! Very nice blog. I must say, I'm looking forward to this. I have to finish reading it first. I absolutely loved finishing the last book in a day, and then watching it. That is the way to go.